Oh what have I started *rolling eyes and giving out a big sigh*??? I have shown a few people the name book I made for my DD youth pastor and his wife for their new baby, well now everyone wants one! Which I guess is good for Cricut since I have told a few "well ya gotta get a Cricut and you can make them". BUT...tonight I cut a base and the letters for a teacher at the school where I work. She is always giving me crafting tips and makes little things for me (she is really irritating sometimes because she is so good at everything). Well today I told her "ya know I know you liked the name book and was interested in making one, what if I cut one for your daughter and you can finish it". She was so excited (I think I heard her actually give out a little squeal)! She told me what kind of theme she wants so I pulled some paper that I had that I thought would be good and matched paper for the letters. I will be so excited to see what she comes up with for the finished product! Her daughter is teaching in Guam right now so she is going with a beach type theme. I started to pull some ebmellies to give her but didn't want her to think I was trying to do the whole thing for her. She asked me tons of questions about the Cricut and I suggested if she get one or get her daughter one that she go with the E. She was really excited when I told her about that one. Oh yeah baby I am excited! The teams playing are......heck if I know! But my LSS is having a sale from 2-4pm that day! OH YEAH!! *does the Kool-aid dance and hits the wall, bout knocking myself out - don't try this dance it will only give you a headache!!! * Anyway papers are 40% off, embellies are 30% off, and something else is 25% off. Don't remember what, but who cares!! I LOVE A SALE! This is a picture of where I shop. No Friday shopping for me this week, savin it for the sale! I have browsed a few days this week so I can get ready for the sale. I am wondering if I should wear a football helmet and pads in case I need to tackle someone who is trying to go after what I have picked out! The owner finally got her website up and running! 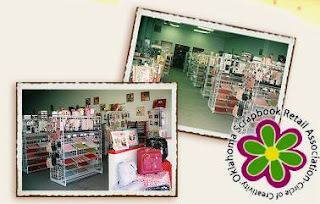 Scrapbooking 24/7 is the name of the store. Man does she come up with some great LO's!